Your child wants to take piano lessons, but you don't have a piano at home. What to do? Do you get a keyboard, or do you buy a "real" piano? At Music Makers, we provide the opportunity to rent a keyboard to start your aspiring young Mozart off, until you are sure of their dedication before investing in a piano. You are also welcome to purchase a keyboard from us or on your own, as they are pretty inexpensive. But, how to choose? Keyboards come in a variety of sizes by the amount of KEYS it has. A piano has 88-keys. Keyboards can come with various numbers of keys. The absolute MINIMUM amount of keys you should rent/purchase is a 61-key keyboard. It isn't my favorite choice, but for very young beginners, it is an okay starting point. They are extremely affordable. My problem with 61-key keyboards is that for children who learn visually and/or learn better with hands-on instruction, they may have a hard time transitioning from working with a 61-key keyboard at home, and then coming into the school and working on a real piano. I will list a few reasons here. 1) MIDDLE C: On a real piano, Middle C is really IN THE MIDDLE OF THE PIANO. Middle C is usually the very first note that a student will learn. They will learn how to find it on the piano, usually at their very first lesson. On a 61-key keyboard, Middle C is flushed over to the right or left a bit. It is not truly CENTERED. 2) RUNNING OUT OF ROOM: One of the first concepts a young pianist learns is the difference between HIGH and LOW on the piano. We think of high as being UP somewhere, and LOW as being DOWN (on the ground, under the ground). On the piano, LOW [PITCHED] keys are to the left, and HIGH [PITCHED] keys are to the right. Now that your child has learned where Middle C is, they get to learn and identify where ALL the Cs are on the piano. With only 61-keys, you run out of notes quickly. 3) FEEL OF THE KEYS/KEY FUNCTION: When you press a real piano key, it has a certain feel to it. Most digital keyboards 61-keys or less will not have the feel of a real piano. The keys are made of a very light plastic. The problem with this is that one of the first concepts that children learn in piano is about the difference of loud/soft. When you press a real piano key, the force in which you use will determine the volume of the sound it produces. Most keyboards that have 61-keys or less do not have this feature. No matter how hard/soft you press the keys, the volume will remain exactly the same. There are two different features that keyboard makers can offer to counter this: TOUCH SENSITIVE KEYS, or WEIGHTED KEYS. Touch Sensitive Keys: These are still light plastic keys, but they respond in volume level to how hard/soft you hit the keys. Weighted Keys: These are heavier plastic keys, which actually feel the closest to real piano keys. They also respond in volume to the amount of force used on them. My suggestion is to invest (minimum) in a 76-key keyboard if possible. The majority of 76-key keyboards have Middle C closer to center, if not centered and have at least touch-sensitive keys. You can still find these at reasonable prices-- a good sale for less than $300.00 usually. If you can find an 88-key keyboard, this is even more ideal, as real pianos also have 88-keys. 88-key keyboards are usually much more costly, and can be harder to find on sale, although a parent recently found one online at CostCo for less than $400.00-- which, believe me is a STEAL!!! The advantage to having a keyboard is that generally, they are lighter and easily portable. Stands to set them on are available (separately) for purchase, or they can go right on your kitchen table (make sure to place something underneath to protect your furniture)! Most keyboards will come with a power cord and can also run with battery power. Stands, headphones, benches and pedals usually must be purchased separately. Another "keyboard" option would be a true digital piano, also known as a clavinova. 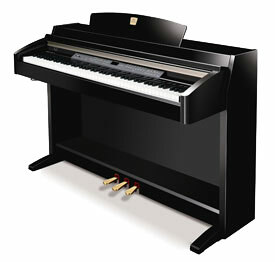 A clavinova has 88-keys and is just about the size of a real piano. Clavinovas can be extremely heavy. If you look at the example below, you will notice the clavinova looks a lot like a real piano. It is already attached to a stand and includes sustain and damper (soft) pedals, items that must usually be purchased separately with a keyboard. Clavinova keys are usually weighted. Neither clavinovas nor keyboards need to be tuned, but repairs on a clavinova could be costly. Because clavinovas are heavier, they are not very portable. It would be best to arrange a permanent spot for it in your home. Clavinovas generally come with everything you need, including a bench. Like keyboards, most clavinovas have a headphone jack, making it convenient to practice at any time without disturbing anyone. The sound is usually closer to the sound of a real piano as well. Lastly, you have the option of getting a real piano. Yes, buying one can be a costly investment, but I would suggest checking Craigslist, or the classifieds for sales of pianos AND clavinovas. Sometimes people are moving and will even offer up a piano for free if YOU will move it/pay to have it moved. I suggest taking someone with you who knows how pianos work/should sound to be sure the piano is worth moving-- free or not. A real piano will need to be tuned at least twice per year and may need repairs every so often, especially if you are purchasing a used one. Sometimes pianos need to be tuned more often if they have been neglected and are horribly out of tune. In conclusion, there really is no right or wrong answer in choosing which you will buy. Renting or purchasing an inexpensive keyboard is a great option while you make sure your child will really stick to learning the piano. Once you see that they are committed to the instrument, it is best (in my humble opinion) to make the investment in 88-keys. Now, whether you go digital or real (what I like to call "pure"), is up to you. There are some who believe there is NOTHING that can substitute for having a real piano in the home. There are others who are quite happy with their keyboards or clavinovas. With the proper care, all can last and bring you and your family enjoyment for years to come!